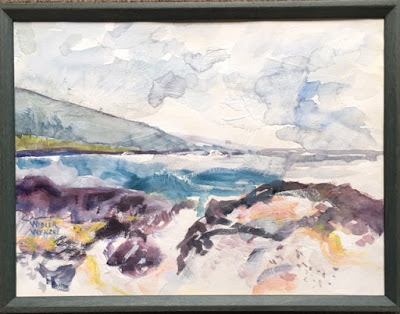 Although I didn't start this painting thinking it would be like a Chinese watercolor, others at the West Hawaii Painters thought it was. Like a Chinese painting the light area ties the painting together working with very linear brush strokes. The color is subdued with the linear elements giving the painting strength. When determining if it was finished, I referred to examples in the book, CHINESE WATERCOLORS by Joseff Heizlar. I was reminded of what I knew about the Chinese organization of distances. Like Chinese paintings which combine three points of view, this panoramic picture was made by moving the camera first by looking down in the foreground, then across the middle ground, and finally up and farther away in the background. The Chinese watercolor,"Pines on a cliff'' pictured above has similar compositional elements.